GoPro: become a PADI Divemaster. Whether you’re looking to gain professional-level understanding of all aspects of diving and divers or work as a PADI Pro diver, the PADI Divemaster course is your first step to becoming a PADI professional diver. As a PADI Divemaster, you’ll be qualified to assist PADI Dive Instructors and lead certified divers at PADI dive centers around the world. This Pro level PADI dive course is very different from the recreational diving courses you’ve taken so far. It’s intended to be tough and challenging, requiring a LOT of hard work, commitment and dedication from you, to become an excellent, professional PADI Divemaster. It’s also a hugely rewarding and possibly life-changing experience. By the time you’ve completed your PADI Divemaster course, you’ll be happy and confident in your ability to lead and take care of recreational divers, safely and enjoyably. Following the same learning system as PADI recreational dive courses, most of the knowledge development is in your own time at your own pace. You’ll discuss and review everything with your Dive Bus PADI Instructor so you’re comfortable with your knowledge level and understanding, and the whole Dive Bus Crew is here to help, guide, work and celebrate the wins with you. Emergency First Responder Primary and Secondary Care (CPR and First Aid) trained, within 24 months before the end of your Divemaster course. Should I take the PADI Divemaster course? Love scuba diving? As a professional PADI Divemaster, you get to do what you love - as a career. This rating is the first rung on the ladder as a professional diver, enabling you to work as a professional diver just about anywhere in the world. As a divemaster, you not only get to dive a lot, but also experience the joy of seeing others have as much fun diving as you do. Scuba divers look up to divemasters as leaders who mentor and motivate others. Working closely with a PADI Instructor, you’ll fine-tune your dive skills, like perfecting the effortless hover, and refine your rescue skills so you anticipate and easily solve common problems. You’ll gain dive knowledge, management and supervision abilities so you become a role model to divers everywhere. You'll also learn about all aspects of diving and develop leadership abilities you'll need to supervise dive activities, assist instructors with student divers and earn respect as a responsible dive professional. And you'll complete water skills and stamina exercises in confined and open water and training exercises to improve your organizational and problem solving abilities. If you’re not already PADI Deep Diver, PADI Enriched Air Nitroxr and Search and Recovery Diver Specialty diver, it’s a good time to take these along with your PADI Divemaster training, to help you meet all requirements and to broaden your experience and abilities. What scuba gear do I need? You'll need to have your own full set of scuba equipment to start your PADI Divemaster course. If not, or you're not sure what works best for you yet, rent The Dive Bus equipment for a couple of fun dives before starting your Divemaster course, to check it out and see what’s right for you. Like it? Buy it, brand new from The Dive Bus retail shop or ex-rental. Besides the obvious benefits of diving with equipment with which you're familiar and comfortable, owning your own dive equipment is a requirement for most dive centers (including The Dive Bus), if you go on to become a professional Divemaster. If you choose to just continue diving recreationally, in addition to the above benefits, you'll save $$$s by not having to rent equipment whenever you dive. You'll also know that it's in great condition and be super-familiar with how it all works. Just like your scuba equipment, all the dive accessories you'll need for the PADI Divemaster course (dive computer; knife; reel; SMB etc etc) are available at discounted prices for PADI Divemaster trainees, from The Dive Bus retail shop. 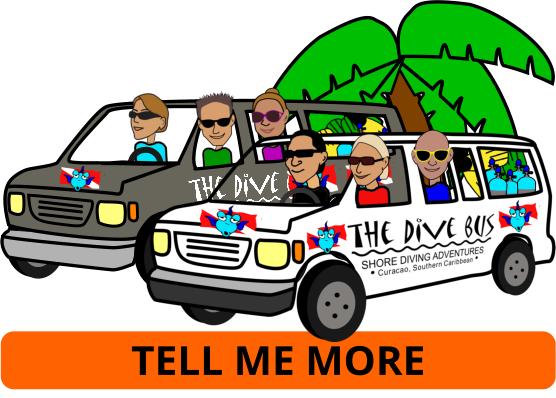 The non-sales-commissioned Dive Bus crew will give you as much advice, and as many tips as you want, about choosing equipment that's right for you. When can I start my PADI Divemaster course? Register for PADI Online – PADI’s eLearning option – to start now. You can work through eight knowledge development sections using a web-based system that lets you learn at your own pace. You also have access to an online version of the Divemaster Manual for reference during and after the course. Also consider taking Dive Theory Online, another PADI eLearning® program, that takes you step-by-step through dive physics, physiology, skills, equipment and environment, plus a Recreational Dive Planner (RDP) review. By successfully completing Dive Theory Online, you can get credit for half of the Divemaster Final Exam. Your Dive Bus PADI Instructor will explain how this works when you meet to schedule knowledge review sessions along with your waterskills exercises, workshops and practical assessments. Another option is to study by reading the Divemaster Manual and watching the Divemaster Video (a book and DVD package). Once you're booked your PADI Divemaster course at The Dive Bus, swing by as soon as you're in sunny Curacao and pick up your PADI Divemaster Crew-Pak, which also includes the PADI Instructor Manual and The Encyclopedia of Recreational Diving, both of which you’ll become very familiar with during your PADI Divemaster course. If you can’t wait until you get to Curacao, pick one up from your local PADI dive shop back home and get started whenever you like. Whichever option you choose, you can be sure that you’ll review everything with your Dive Bus instructor with you, to ensure you’re comfortable and ready to go on and change your life forever..
Like all activities at The Dive Bus, the PADI Divemaster course is payable in full whenever you're ready to confirm your reservation. Additional expenditure, such as dive equipment, accessories, drinks etc, are payable weekly. Click here for Booking Info . "Great place for Divemaster training"
"Perfect place to do your PADI Divemaster course"
"What a dive shop - it was legen... -wait for it- ..DARY. " Download and check out the Medical Statement and Questionnaire (pdf). You'll need to have this signed off in full by your doctor, no more than 12 months before starting your PADI Divemaster course, to ensure that you're medically cleared for becoming a PADI professional diver. Once all's good with your Med form, download, complete and email us your PADI Divemaster Enquiry form. This will give us all the info we need to confirm availability and pricing for you. Make a start on the Knowledge Development sections of the PADI Divemaster course with the PADI eLearning program, whenever you're ready. Simply register for Divemaster Online and sign up for Dive Theory Online on padi.com.